Our advice is forget Vegas with all its traffic, smoke, and ugliness, and instead, head west of sin-city for two distinctly different, yet wonderful adventures in nature: Ash Meadows National Wildlife Refuge and Red Rock Canyon National Conservation Area. 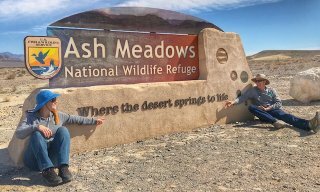 Ash Meadows NWR is most certainly a hidden gem, tucked away near the border with California, about 30 miles northwest of Pahrump (where we camped), and about 40 miles east from the heart of Death Valley National Park. 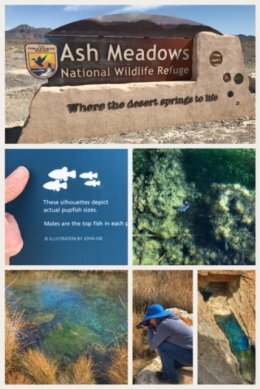 While there were several highlights of our adventure to Ash Meadows, the one that stands out the most is the mighty little Ash Meadows Amargosa Pupfish (as well as several other species of pupfish, including the Devil’s Hole Pupfish), an inch-long blue fish that survived not only the desert conditions, but also developers and ranchers who were draining the aquifer and putting these fish dangerously close to extinction. Luckily for the Pupfish and other plants and animals, the Nature Conservancy stepped up in 1983 and purchased 13,320 acres to prevent it from becoming a massive development. It became a national wildlife refuge in 1984. 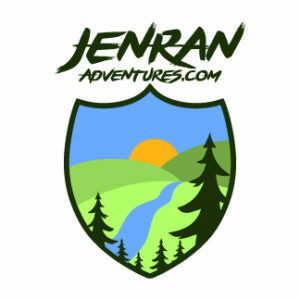 In total, it encompasses more than 23,000 acres of spring-fed wetlands and alkaline desert uplands. Ash Meadows, which is named for the abundance of ash trees once found in the area (but stripped away by the ranchers and developers), is the largest remaining oasis in the Mojave Desert, and contains 30 species of plants and animals that do not exist anywhere else on Earth (endemic species), and water that comes from melted ice from the last ice age (also called fossil water). 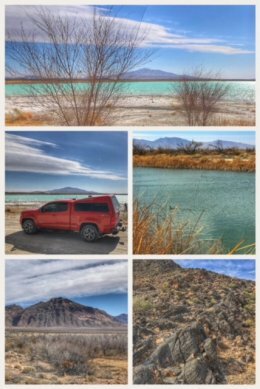 When you go to this beautiful refuge, make certain to stop at Crystal Reservoir, Point of Rocks (where you walk a well-constructed boardwalk and can see the pupfish first-hand), and Devil’s Hole (a 500+ foot deep cavern technically under the domain of Death Valley National Park). The visitor’s center offers information, a short video, restrooms, and a little store. 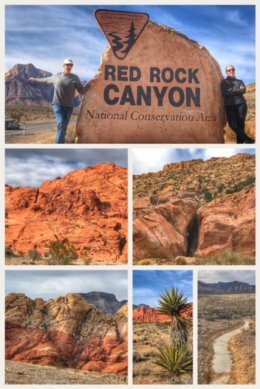 Another surprise for us was Red Rock Canyon National Conservation Area, which offers lots of hiking trails and an amazingly fun scenic drive, and is located about 17 miles west of Las Vegas. We enjoyed a spectacular hike on Moenkopi Trail, which starts to the west of the Visitor Center, and which takes you onto this cool ridge that was once the bottom of an ancient sea; the trail also offers some panoramic views of the surrounding mountains. The 13-mile scenic drive offers numerous opportunities to stop and admire the rocks and/or take additional hikes. We especially enjoyed the High Point Overlook and Willow Spring Picnic Area. In fact, there are more than 25 trails within Red Rock. 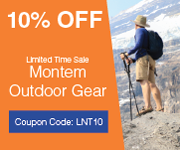 Other outdoor options include rock climbing, horseback riding, bicycling, and picnicking. The conservation area is managed by the Bureau of Land Management (BLM). The visitor center offers numerous exhibits and a gift/book shop. 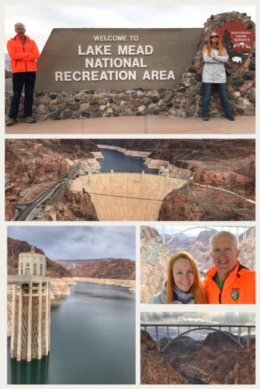 The final adventure on this stop included the Lake Mead Recreation Area, and, more specifically, Hoover Dam, located about 30 miles southeast of Las Vegas. The dam is a pretty amazing engineering feat, given its construction in the early to mid 1930s. Built in the Black Canyon on the Colorado River, this concrete arch-gravity dam was originally named Boulder Dam, but renamed Hoover Dam in 1947 (in honor of President Herbert Hoover)… and the area that became flooded from the dam and that serves as a reservoir is Lake Mead (the largest reservoir in the U.S., when full — which it is far from currently). The dam’s functions include producing hydroelectric power, flood control, and irrigation. Be prepared to spend a little money when visiting. Parking is $10 and a trip to the visitor center is another $10. If you want to take in one of the tours, it will cost you a bit more. 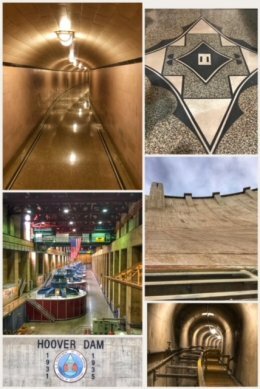 We did the Dam Tour ($30), and thoroughly enjoyed seeing a peek inside the dam, as well as lots of trivia about its construction and current state of operations. Some fun facts about the dam: It cost $49 million to build the dam, or roughly equivalent to $833 million today; almost 4 million cubic yards of concrete was used in construction of the dam — enough concrete in the dam to pave a two-lane highway from San Francisco to New York; through 2010, the highway between Phoenix, Arizona, and Las Vegas ran across the top of the dam, but because of 9/11 and other security concerns and traffic issues, a new bridge was built just downstream of the dam. Which leads to our final tip. For the best views of the dam, take a short hike up to the Highway 93 Bypass Bridge (formally known as the Mike O’Callaghan-Pat Tillman Memorial Bridge), which includes a wide pedestrian walkway. No trip to Nevada (or any other state on our adventure) would be complete without checking out the wineries. We partly chose Pahrump because two of the state’s four commercial wineries are located here. A vinter in Arizona warned us that Nevada wines were not anything to write about, but we had fun nonetheless. 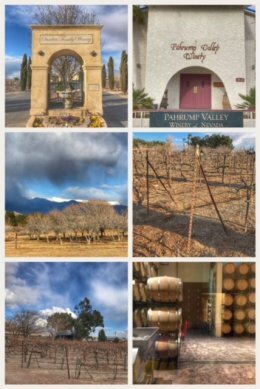 And the wines at both Sanders Family Winery and Pahrump Valley Winery were pleasant… plus, it was nice to have free tastings for a change. Both tasting rooms were charming in their own ways, and Pahrump Valley Winery has an award-winning restaurant that you might want to consider for lunch or dinner. While none of the wines spoke deeply to us — Nevada wines seem to almost be wine-light — we of course felt a need to buy a bottle from each winery. 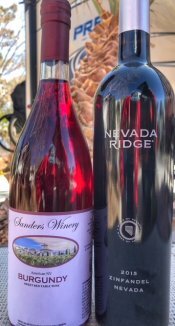 The Burgundy from Sanders is sweet and light and will make a great drink on a hot summer day; the Nevada Zinfandel we bought from Pahrump Valley will be a fine wine with a future chicken or fish dinner. We will have to return to Nevada in early fall after we travel through Utah because snow and sub-freezing temperatures at Great Basin National Park caused us to do a little re-routing. Next up: Back to California and Death Valley National Park… as we work our way around the Sierra Nevadas and into Central California.